Joseph Rodan first represented Fiji in Athletics at a South Pacific Games in Guam in 1975 and continued representation for sixteen years at the following South Pacific and Mini Games. His events ranged from 100m, 200m, 400m, 110m and 400m Hurdles to Member of the 4x100m and 4x400m Relay Teams. For his success at the 1983 SPG in Apia in winning 2 Gold Medals in the 400m and 400m Hurdles Joseph was nominated and won the prestigious Fiji Sportsman of the Year award. In 1982 he was selected to represent Fiji at the Commonwealth Games in Brisbane, and two years later at the 1984 Los Angeles Olympic Games. He was a member of the Fiji Athletics Team to the Commonwealth Games in Edinburgh, Scotland in 1986 and also competed in the 400m Hurdles event at the Olympic Games in 1988 in Seoul, Korea. Throughout his successful and competitive years Joseph amassed 14 Gold, 9 Silver and 5 Bronze SPG, Oceania Athletic and Veteran Athletic medals. 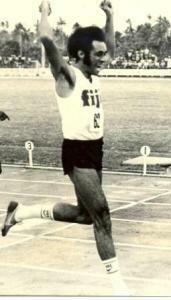 Upon retiring from competition this athlete turned to coaching and has accompanied Athletic Teams to the 1997 SPG in American Samoa, 1998 Commonwealth Games in Kuala Lumpur, 1999 SPG in Guam, Sydney 2000 Olympic Games, 2002 Commonwealth Games in Manchester and the successful Athletics Team at this years SPG in Suva.